The bass part for Strauss' Ein Heldenleben, Op. 40 has been edited by Paul Ellison, in-demand double bassist, professor, presenter, and former Houston Symphony Orchestra principal bassist of 23 years. Ellison's bowings, fingerings and other editorial markings have been added throughout the score. Ein Heldenleben is a tone poem by Richard Strauss, his sixth composition in this genre, completed in 1898. Greater in scale and demand than any of his previous tone poems, Ein Heldenleben runs at about fifty minutes and is through-composed – performed without breaks – with the exception of a dramatic grand pause at the end of the first movement. It is generally agreed upon that this work is autobiographical in tone, as it contains over thirty quotations from Strauss' earlier works. 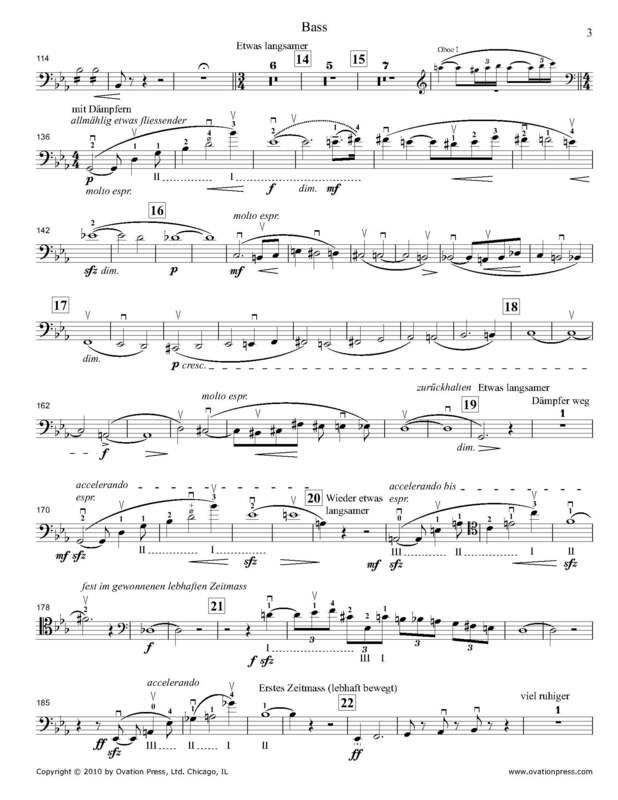 Download and print the score today to gain access to expertly edited Strauss Ein Heldenleben bass fingerings and bowings from Paul Ellison! Please note: This score is only available for purchase by customers located in the USA and Canada. All my editing is done in the spirit of "living editions." They are never finished or to be considered set in stone. Bowings, articulations, fingerings, dynamics and phrasings may change with conductors, historical performance considerations, change of instrument, bow or strings, differing venues, individual physical considerations, change of climate or altitude not to mention additional acquired knowledge or change in personal taste. Asking oneself to have about five ways to play most passages seems to cover the fluctuating circumstances mentioned in addition to giving oneself reason and context for choices to be made. Each set of performances of any major work is likely to prompt some change(s). The very nature and future of music as an art form demands live, dynamic, fresh interpretations which frequently necessitates realizing that there actually is no "rule book" and that the "bass police" will never actually show up. Please accept this editing in the spirit of knowing that our skills and abilities are in constant flux and may require many possibilities. Here's to great music making.